From a long list of names, we finally picked 10 that stood out for the uniqueness of their businesses or rapid growth. Our second annual listing of the most happening young ventures. The economy may be slowing down, but not if you looked at the start-up scene. One Bangalore based outfit, launched in October last year, has raked in Rs 35 crore in revenues in just three months; another in Chennai is snapping up companies abroad; and yet another in Kolkata has found a niche in on-demand network security that is entirely its own. So, who are these people coming up with gravity defying business ideas? A wide variety of professionals, as our second annual listing of India’s 10 Hottest Start-Ups reveals: executives, students, professors, and even doctors. To zero in on the most happening young ventures, Business Today spoke to venture capitalists, executives, and industry watchers. From a long list of names, we finally picked 10 that stood out for the uniqueness of their businesses or rapid growth. Finally, we also bring you an update on our last year’s list of hottest start-ups. For 10 years between 1995 and 2005, Rajashekhar Reddy Seelam, or Raj Seelam as he prefers to be called, ate no cabbage or cauliflower. No, he’s not lachanophobic (afraid of vegetables, that is), it’s just that he can’t stomach the thought of eating what often comes with vegetables and fruits: pesticides. “These 90-to-150-day vegetables such as cabbage and cauliflower are put through 30 rounds of pesticide spray before they are picked,” says Seelam. “With cooking, the microbes get killed but the pesticide residues remain,” he says in horror. Size of target market: $38 billion globally, and Rs 1,000 crore in India. For Seelam, the pendulum has swung the other extreme. Between 1988 and 2000, the IIM Ahmedabad alum sold pesticides and fertilisers to farmers at the Murugappa Group company EID Parry and later moved to selling seeds as the National Sales and Marketing Manager. Working closely with farmers gave him first-hand knowledge of the havoc pesticides wreak, but it also gave him a business idea, which today has taken the shape of Sresta Natural Bioproducts, a farm-to-fork organic food business in Hyderabad. “This is something I had wanted to do for more than 10 years before I launched Sresta in 2004,” says Seelam. He has travelled a long way since. In the first year (between 2000 and 2004, Seelam spent time ‘preparing’ farms for organic cropping), he had 2,000 acres and 250 farms under organic farming, spread across five states and processing in all 200 tonnes of organic foods. 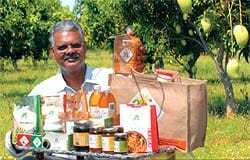 Today, he has 12,000 acres under organic farming, works with close to 1,200 farmers spread across 10 states and is able to process 6,000 tonnes of organic products (ranging from grain and fruits to pickles, jams and bakery products). Sresta’s produce, worth Rs 6 crore last year, is sold not only in India (through his own four outlets called 24 Letter Mantra and other retailers) but also in markets such as the US and Europe, which fetch 60-70 per cent of Sresta’s revenue. “By 2011, I want to increase processing to 25,000 tonnes,” says Seelam. If his plans pan out, then a whole lot of health-conscious Indians—not just Seelam—may get to eat pesticide-free food. The 2007 list: How are they doing?